Bankers and small business owners: protecting your business against cyber crime is now more important than ever. In 2015, the U.S. Director of National Intelligence ranked cybercrime as the No. 1 security threat in the country. Despite popular belief, cyber criminals actually prefer small businesses institutions simply because they are easier to infiltrate. As technology advances, cybercrime tactics used to steal your business’ sensitive data will advance as well. Payroll outsourcing company Paychex cites that over 70 percent of cyber attacks specifically target smaller companies. Let’s take a look at four crucial cyber threats that could impact your business’ data security in 2016. Businesses feel the effects of data breaches through financial losses and loss of customer trust. 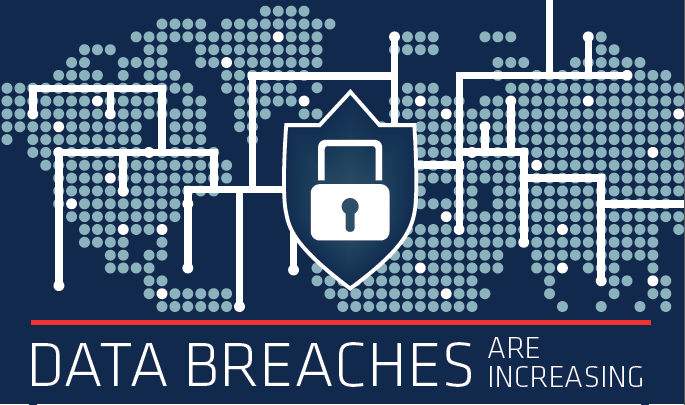 The number of data breaches that have occurred in 2016 – 725 – is on track to surpass last year’s total count of 781. Recovery from an SMB data breach can cost between $36,000 and $50,000, which can be especially devastating to smaller companies. Malware is most often introduced to a company’s secure network via phishing emails sent to employees. Symantec noted that the number of spear phishing attacks targeted at employees working for small businesses increased by 55 percent in 2015. Knowing that only 7.9 percent of an SMB’s budget on average goes toward the business’ security, hackers are much more likely to launch cyber attacks against small businesses that have weaker security systems. Unauthorized access to your network via a security flaw can be damaging to your company. Hackers take advantage of security flaws within your business’ software because they act as backdoors into your network. According to the Cloud Service Alliance, 75 percent of all cyber attacks target known vulnerabilities. The Shellshock bug continues to pose a significant threat to a wide range of businesses, accounting for 13 percent of all retail cyber attacks in 2015. Shellshock is particularly threatening to businesses because it affects commonly used server operating systems such as Linux or Unix. In fact, over 80 percent of Internet hosts sites are affected by Shellshock. If exploited successfully, the vulnerability can allow criminals complete access and control of your business’ network. While mobile devices are meant to improve efficiency, criminals can also exploit unsecured laptops and smartphones to gain entry into your business. Many businesses allow employees to connect their personal devices to the corporate network — so-called “bring your own devices” or BYOD. However, this can pose a threat to your company’s cyber security since over 75 percent of employees do not secure their computers. Eugene Bekker originally joined EZShield in 2008 as a consultant and today he oversees the architecture of the core technology platform, as well as manages EZShield’s security and compliance program. Prior to EZShield, Eugene was the Chief Architect at PowerVision Corporation, an Information Technology and application development consultancy. He boasts over 20 years of experience in the areas of Information Technology and software engineering. Eugene holds a BS in Computer Science from the University of Maryland, Baltimore County and an MS in Computer Science from The Johns Hopkins University.